I am certainly going to build this one. I will post some pictures here when I do. There are two main designs for vertial 802.11 antennas available. The first is based on a design from Guerilla.net. A few other groups have nicked this design ( tux.org and MelbWireless ). The second is based on a design by JA7YTB in the The Radio Amateurs Magazine from Japan here and here. The design of the antenna from guerrilla.net has a non-obvious derivation. There are errors in the design as presented. In fact attempts at construction have led us to believe that this design should not be used until the design itself has been verified. Measurements for the design mostly do not make sense. The second design is much better in terms of design calculations. It is simply 3/4 wavelength sections with 1/4 wavelength sections bent for phasing. Ok, some more testing was done on the weekend, this time with hardware suitable for user (leaf) nodes. Most users have desktops, necessitating a $120 investment on a PCI -> PCMCIA adaptor. LMR-400 is not cheap and there is an appreciable investment involved to buy it (around $120-$140 for a 10m cable) Pigtail cables are very lossy and expensive to boot. The Lucent connector alone is rated with a SWR of 1.56:1 at 2.4 Ghz, to say nothing of feedline losses and poor construction techniques. In short, Losses between the card and the antenna are high, as are the costs involved in setting the whole thing up. In our particular application there are bigger problems. 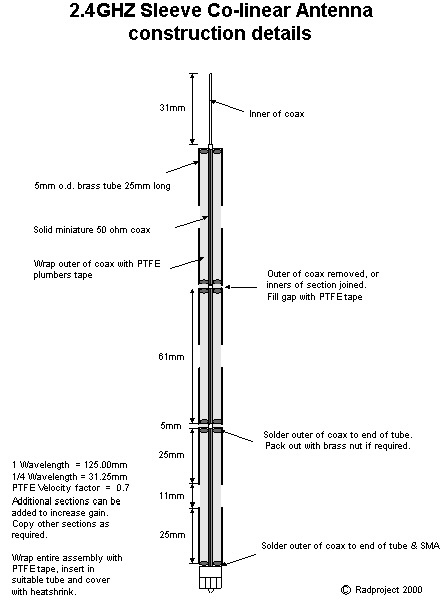 We are planning to mount the Galaxy antenna on the roof, about 6-8 m up a TV antenna mast. Common sense would kind of dictate that we are not going to run a 15-18m length of LMR-400 to the office downstairs. The smartest thing to do would be to put an AP or a computer in the roof and run ethernet the rest of the way. In order to do this we are also going to need 10 m of feed line. The AP is also not to good as it is expensive and requires our neighbours to have a card in infrastructure mode. We wanted to try another method. The plan was to use a USB based card (in this case the Dlink DWL-120). These are cheap, easily modified and allow us to run a simple USB cable up the mast. The unit is smaller than a AP and cheaper. Our first job was to test the performance of the card as both of us had heard they didn't go as well as a PCMCIA unit. Testing on a celeron 400 running win 2k and 64 mb ram, showed us downloading a 20Mb file from a local ftp server at 470k/sec. Not too shabby at all, so this was obviously worth the trouble to test. There may be an issue with USB being a bit slower than PCMCIA, but will everyone really be running at 11Mb? So far so good, the next question is, can we get into it? This turned out to be fairly simple. The board is setup for easy access to the antenna terminals. We also found that the second antenna is easily disabled and connected to an external antenna. This has  some serious possibilities. We could run two antennas in diversity mode. Due to the negligible amount of additional coax, this is quite inexpensive. The whole lot can be mounted in a waterproof box very close to the antenna feed point. Having some surplus Galaxy's about we had an interesting idea. What if we put the card in front of a grid in about the same place as the dipole sits in the feedhorn? Some experimentation came up with a fairly predictable result. Approximately 13db gain on the original signal levels. With some more accurate positioning and a few mods, I am sure this could be better. So with some work we might not even need to open the box and take to it with soldering iron. Now the cabling.... It seems you can only run 5m of USB cable between two devices. That's a real shame because we were so close. However, we found a 5m active USB cable advertised at www.ht.com.au . Seems you can use this with a simple 5m cable to do 10m. You can use 4-5 of these things if you really want to get 20-25m of USB. We have seen prices elsewhere as low as $30 / 5m cable. So it works out about $6 per meter in cable. Less than LMR-400 and definitely less than the LMR-400 and the connectors for each end. The USB cables are definitely easier for the amateur to setup too. The only remaining problem was that of our PC. We have some old 486's and some low end Pa's that we want to use in the roof at each end. Unfortunately no USB ports. Nevermind www.ht.com.au has some USB dual port cards for $29 and they work with Linux. Much better than the $120 PCI -> PCMCIA converters. The testing continues and I'll keep you all posted.